F/A-18E with landing gear deployed. F/A-18F landing on a Nimitz Class aircraft carrier. Weapons separation tests have been conducted since 1997. F/A-18E/F supports a full range of armaments. A Super Hornet E/F firing an AIM-120 advanced medium-range air-to-air missile (AMRAAM). F/A-18F taxiing into position on the aircraft carrier. The ALQ-99 jammer fitted on an F/A-18F Super Hornet. F/A-18F on final approach with tail-hook deployed. The Super Hornet is equipped with the Raytheon APG-73 radar. F/A-18E Super Hornet refuelling from a KC-130T Hercules. Super Hornet is about 25% larger than its predecessor the F/A-18C/D, but contains 42% fewer structural parts. The single-seat F/A-18/E and the two-seat F/A-18/F fly greater ranges with heavier payloads, have more powerful engines and provide greater survivability. The first low-rate initial production aircraft was delivered in December 1998, and all 12 of the first batch were delivered by November 1999. The US Navy placed an order for 30 Super Hornets in February 1999, in addition to the 12 already ordered. "The Super Hornet is a maritime strike attack aircraft." Following successful completion of operational evaluation, in June 2000 the USN ordered 222 fighters to be produced over five years. The first full-rate production aircraft was delivered in September 2001. A second multi-year contract was signed in January 2004 for 42 aircraft to be purchased between 2005 and 2009. Total requirement was for at least 545 aircraft. More than 500 aircraft had been delivered by April 2011. The F/A-18E/F began its maiden operational deployment on board USS Abraham Lincoln (CVN 72) in July 2002. Super Hornet made its combat entry in November the same year, striking air defence sites in Southern Iraq with Joint Direct Attack Munitions (JDAM). The aircraft was also deployed as part of Operation Iraqi Freedom in March 2003. Improvements scheduled for Block 2 aircraft include a redesigned forward fuselage which has fewer parts, as well as changes to the aircraft’s nose to accommodate the Raytheon APG-79 Active Electronically Scanned Array (AESA) radar. The first aircraft was delivered in September 2003. The aircraft is fitted with new mission computers, a fibre-optic network and a Raytheon AN/ASQ-228 ATFLIR targeting pod. Boeing joint helmet-mounted cueing systems and Raytheon AIM-9X next generation Sidewinder air-to-air missile capabilities were also included in the design. Boeing announced in April 2007 that it had been asked by the US Navy to provide an Infrared Search and Track (IRST) system for the F/A-18E/F. Boeing has selected Lockheed Martin Missiles and Fire Control to supply the system. The US Navy awarded a $135m contract for engineering and manufacturing development of the IRST sensor system in November 2011. The IRST system is expected to be deployed aboard the aircraft in 2017. .
Australia requested the FMS of 24 F/A-18F Block 2 aircraft in February 2007. The contract was placed in May 2007. The first five aircraft were supplied in March 2010, with the rest delivered by October 2011. The F/A-18F Block 2 aircraft cover the capability gap between the retirement of the F-111s in December 2010 and the delivery of the first F-35 Joint Strike Fighter to Australia in 2018. The US Navy has approved System Development & Demonstration (SD&D) for an electronic attack version of the Super Hornet, the EA-18G, to replace the EA-6B Prowler. EA-18G incorporates the Improved Capability III (ICAP III) suite developed for the Prowler. Two SDD aircraft were delivered. First flight of the EA-18G was in August 2006. Boeing received a $48.9m contract in May 2009 for the development of a Distributed Targeting (DT) system for Super Hornet aircraft. The US Navy awarded a $48m contract in November 2011 to develop the Type 4 Advanced Mission Computer (AMC) for F/A-18E/F Super Hornet, which replaced the Type 3 AMC. Boeing and the US Navy proposed to offer F/A-18E Super Hornet Block II version aircraft to the Japan Air Self Defence Force (JASDF) in September 2011. In the same month the US Navy awarded a $5.297bn contract for the delivery of 66 Super Hornet aircraft between 2012 and 2015. Boeing was awarded a $82m contract by the US Navy for the supply of 12 IRST systems in, December 2016. The cockpit in the F/A-18E/F is equipped with a touch-sensitive control display and a larger multi-purpose liquid crystal colour display, which shows tactical information, two monochrome displays and a new engine fuel display. "The Super Hornet has 11 weapon stations." The aircraft retains the mission software and a high proportion of the avionics found in the C/D models. The cockpit also has a colour digital map and the pilots are equipped with night-vision goggles. The zero / zero ejection seat is the SJU-5/6 supplied by the Martin Baker Aircraft Company in the UK. The Super Hornet has 11 weapon stations, which include two additional wing store stations and will support a full range of armaments including AIM-9 Sidewinder, AIM-7 Sparrow and AIM-120 AMRAAM air-to-air missiles. It also possesses guided air-to-ground weapons capabilities such as Harpoon, SLAM/SLAM-ER, GBU-10, GBU-51, HARM and Maverick, as well as free-fall air-to-ground bombs, Mk-76, BDU-48, Mk-82LD, Mk-82HD and Mk-84. The aircraft can also carry the GPS / inertially guided JDAM Joint Direct Attack Munition (JDAM), joint stand-off weapon (JSOW) and joint air-to-surface stand-off missile (JASSM). Boeing is the prime contractor for the Joint Helmet-Mounted Cueing System (JHMCS) for the Super Hornet, to be fitted to Block 2 and retrofitted to Block 1 aircraft. Vision Systems International, which is jointly owned by Kaiser and Elbit, is the major subcontractor. JHMCS is currently in full-rate production. Deliveries of full-rate production systems began in 2005, although the system was deployed operationally during Operation Iraqi Freedom. The F/A-18E/F new lightweight gun system is the General Dynamics M61A2 20mm Gatling gun, which has a switchable firing rate of 4,000 or 6,000 shots a minute and a fully integrated linkless ammunition feed system. AN/ALQ-124 integrated defensive countermeasures systems (IDECM) provide coordinated situation awareness, and manage the on board and off-board deception countermeasures, the expendable decoys, and signal and frequency control of emissions. The system has been jointly developed by BAE Systems information and electronic warfare systems (IEWS, formerly Sanders) and ITT Electronic Systems. The IDECM system includes the ALE-47 countermeasures dispenser, the ALE-50 towed decoy and the AN/ALR-67(V)3 radar warning receiver. "The Super Hornet’s power is provided by two F414-GE-400 engines." IDECM began operational evaluation in December 2002 and was successfully deployed during Operation Iraqi Freedom. BAE Systems Integrated Defense Solutions’ (formerly Tracor) ALE-47 countermeasures dispenser system is capable of dispensing chaff cartridges, flares, and the POET and GEN-X active expendable decoys. The ALE-50 Towed Decoy from Raytheon E-Systems provides long-range detection and extremely fast deployment against most radar-guided threats. BAE Systems AN/ALE-55 fibre-optic towed decoy replaced the ALE-50. The Raytheon AN/ALR-67(V)3 radar warning receiver intercepts, identifies and prioritises threat signals, which are characterised in terms of frequency, amplitude, direction and pulse width. The Super Hornet is equipped with the APG-73 radar manufactured by Raytheon. The APG-73 radar has an upgraded processor with increased speed and memory capacity in comparison to the AN/APG-65, which was installed on the earlier builds of the Hornet. The modes of the APG-73 include air-to-ground tracking, air-to-air velocity search mode, range while search and track while scan. 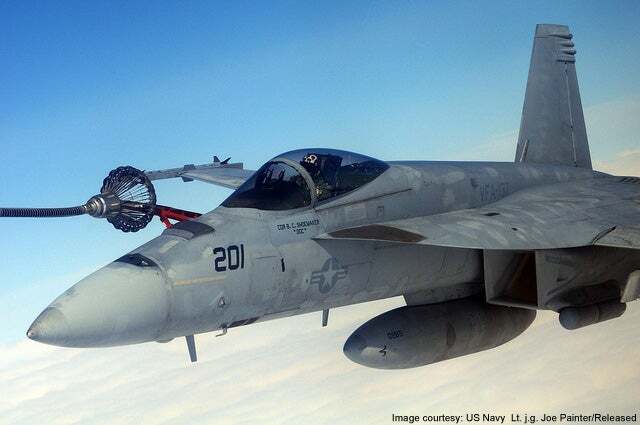 Raytheon’s AN/APG-79 Active Electronically Scanned Array (AESA) fire control radar increases the F/A-18’s air-to-air target detection and tracking range, and provide higher resolution air-to-ground mapping at longer ranges. The AN/APG-79 AESA entered Low Rate Initial Production (LRIP) in September 2003 and began Operational Evaluation (OPEVAL) in July 2006. It is fitted to block 2 aircraft and retrofitted to 135 block 1 aircraft. The radar began operational deployment on the USN F/A-18s in 2008. The aircraft is also fitted with the Raytheon AN/ASQ-228 ATFLIR (Advanced Targeting Forward-Looking Infrared) precision targeting pod. ATFLIR consists of a 3-5 micron staring focal plane array targeting FLIR, BAE Systems Avionics high-powered diode-pumped laser spot tracker, BAE Systems Avionics navigation FLIR and CCD TV camera. Initial Operating Capability (IOC) was achieved in April 2003. US Marine Corps aircraft are fitted with the Northrop Grumman Litening AT Advanced Targeting pod, with 540×512 pixel FLIR, CCD TV, laser spot tracker, infrared laser marker and infrared laser rangefinder / designator. F/A-18F aircraft is also fitted with the Raytheon SHARP multi-function reconnaissance pod, which replaces USN Tactical Airborne Reconnaissance Pod (TARPS). SHARP is capable of simultaneous airborne and ground reconnaissance and has sensors manufactured by Recon/Optical Inc.
16 LRIP systems have been ordered and the first was delivered in April 2003. The system is deployed on aircraft operating from USS Nimitz carriers. "The F/A-18E/F’s maiden operational deployment was in July 2002." The aircraft’s power is provided by two F414-GE-400 turbofan engines from General Electric. The engines are an advanced derivative of the GE F404 engines installed on the Hornet. The air inlets have been enlarged to provide increased airflow into the engines. Each engine provides 22,000lb thrust, with afterburn giving a maximum speed in excess of Mach 1.8. The structural changes to the airframe on the F/E variant of the aircraft increase the internal fuel capacity by 3,600lb, a 33% higher fuel capacity than the F-18C/D variant. This extends the mission radius by up to 40%.